People turn to a wide variety of sources for stress relief. Some people like to shop. Other folks might eat away their woes. I’ve even heard that some people like to exercise to take the tension off. None of those methods have ever been quite as effective for me as getting behind the wheel of a motorized vehicle and slamming into another while going 90+ miles per hour. Of course, doing this in real life would get me arrested. Thankfully, there’s Wreckfest! Now I have a place to get my cathartic crunch, without doing 6-10 in the state pen. 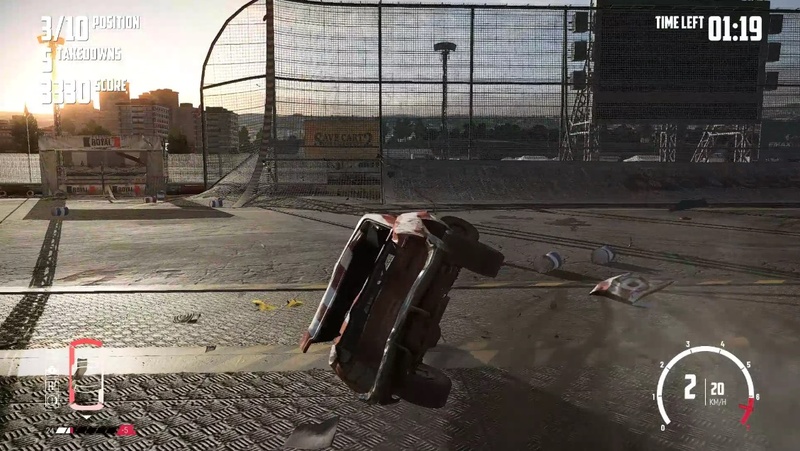 Wreckfest was developed by Bugbear Entertainment Ltd, based in Finland. These guys have been making racing games since 2000, including games similar to Wreckfest such as Flatout and Rally Trophy. 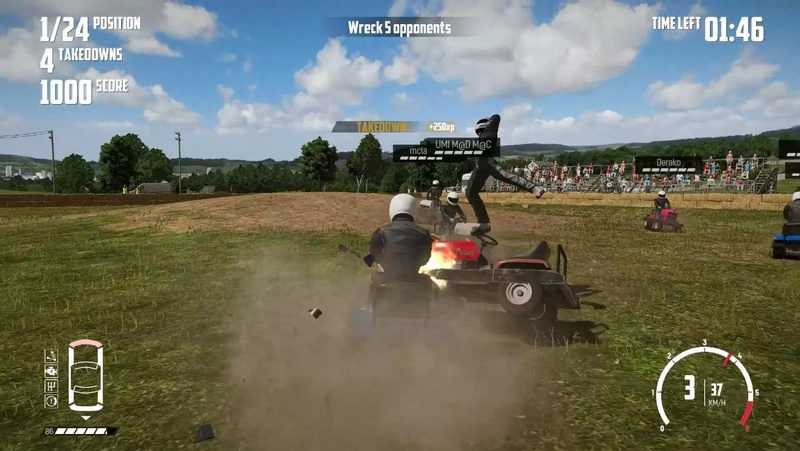 One could even say that Wreckfest is something of a blend between the two, offering a wide variety of rally style races in vehicles that have definitely seen better days – and are about to see a lot worse. 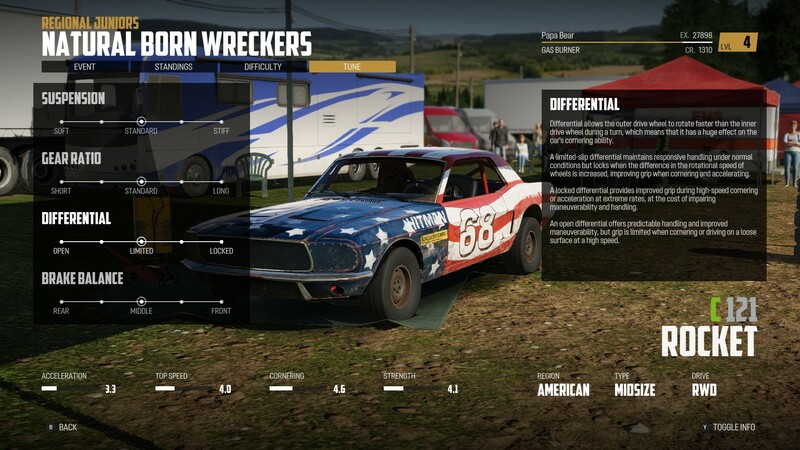 In Wreckfest players get behind the wheel of a number of different vehicles in different classes; there are compact, midsize and full-size vehicles from America, Asian and European markets. American and European markets also offer a range of wagon class vehicles, which includes an El Camino as well as an SUV. For the more eccentric minded, there are even races and demolition derbies including buses and lawn-tractors, as well as the mighty combine harvester. 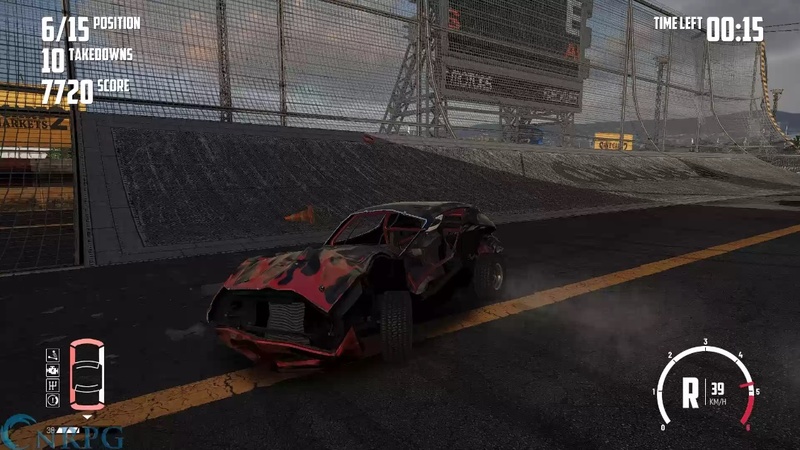 There are two main modes to Wreckfest, demolition and racing, each with various sub-modes. In demolition there are Team Deathmatch, Deathmatch, and Last Man Standing. 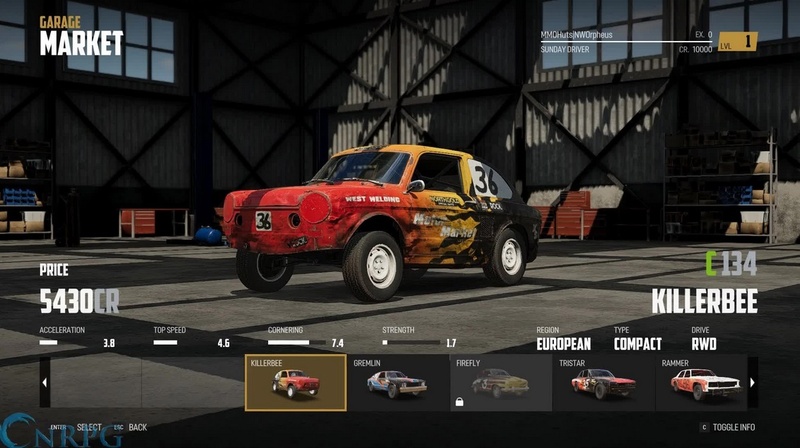 Races can include elimination races (where after each lap, the last place car and whoever crashes out are eliminated), banger races, and team races. Different races can be restricted to different classes of cars, etc. All in all, there’s a TON of race diversity. The events themselves are broken into three playstyles: career mode, custom events, and multiplayer. Career mode is single player and involves collecting championship points from each race or event, which allows you to advance your career from Regional Juniors to World Masters. 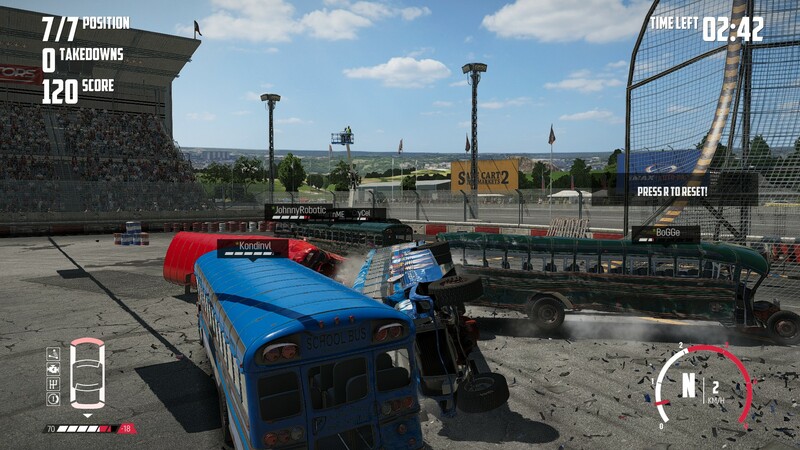 Custom Events are great for experimenting with different vehicles in limited scale events, such as a school bus demolition derby. Multiplayer is, in my opinion, where the game really shines, allowing you to take your skills online to play against other players, or a mix of players and bots. There are a number of servers players can join, including official dedicated servers hosted by Bugbear. Players also have the option to host a server for specific races. Let me just say, you haven’t lived until you’ve hopped on a riding-mower against 23 other players in a no-holds-barred digital deathmatch. Wreckfest also has quite the community of players behind it. There’s an active Discord where people can (and do) seek and offer help, share mods (also available via Steam workshop), and set up races or tournaments. I truly haven’t seen any elements of online toxicity that sometimes crops up with games played over the internet, and it’s refreshing. Among the mods that you can find are skins for cars, paint styles, and new race tracks. The paint jobs are one of the main focal points of cosmetic modifications. You can alter which logos appear, and then additionally change the color of various panels. All in all, this gives you the ability to design a car that feels uniquely yours. It doesn’t stop there though. Most vehicles also have spoilers, rims, and other accessories you can add. Both in and out of races, you’ll be treated to a variety of Rock and Metal music tracks to get, and keep, your blood pumping. I really and truly enjoyed the soundtrack, to the point where I found it on YouTube and have listened to it while doing dishes or other tedious tasks to make them more enjoyable. Graphically, the game does leave a bit to be desired. I feel like they’re something I could have gotten from a PS3 game. This certainly doesn’t make them bad graphics, because let’s face it, PS3 had great graphics. At the same time, it doesn’t feel like any real effort was made to advance the craft, and for a game from a AAA publisher that wants 44.99, I would like to see more. For example, when your car gets banged up, the door gets dented in, and the driver’s body is warped with the damage. This in many ways just feels lazy to me, amusing though it might be to see. I mentioned before that you customize your vehicle aesthetically, but (arguably) more importantly you can also customize its performance. This is done in two ways: 1) by upgrading parts, and 2) by tuning the vehicle. Parts upgrades includes a variety of familiar things: sports and racing cams, sports and racing pistons, sports and racing cooling systems, etc. Why someone would in reality slap expensive parts into what is essentially a junker, I’m not sure, but hey, vidya games, right? You can additionally fine tune aspects of the car; gear ratio, suspension, differential, and brake balance. It’s nice because when you select any of the bars for these adjustments the game tells you what you get from different settings. On the downside, you’re limited to 5 specific settings for each aspect. This means that while you can tune your vehicle, it is only within a very strict range. Your gear ratio is “long” or “short” for all gears, for example, or “default” in the middle, as opposed to games like Gran Turismo where you can adjust each gear individually. One other minor complaint is that while the tuning window does give you some guidance on what you’re doing, there are really no tutorials otherwise. Sometimes you might glean a bit of info from a loading screen, but the chances of it coming up before you might have needed that information are low. This isn’t a critical failure, and you can bluster through things with trial and error to an extent, I still felt that some degree of instruction could have been beneficial. All in all, I had a lot of fun with Wreckfest. There are certainly some really great features to it. The tracks, the scenery, the music and the cars themselves. The fact that the community can create cars and tracks is also a huge boost. I really wish I could give both thumbs up on this game, and urge everyone to go out and buy it. Unfortunately, I feel like the fun I did have is bound to wear off after a short amount of time, and there’s not a lot to do in the long haul. I’m not sure that lawnmower battles would ever entirely get old, but I don’t know if I could play them over and over again all evening. Usually 1-2 matches of that type is good for an unwind, and then I go do some house chores (while listening to the game’s soundtrack on YouTube). Some people might enjoy the races long term, but I think that crowd is going to be limited, and with the game’s real shine being online play, you’d need a much wider audience to create a strong playerbase to keep each other entertained. In my mind, I just don’t see there being enough people willing to pay out 45 bucks for something that generally lacks innovation in a racing game, and I think that’s going to be the downfall of the game. By the time they start having regular sales, it’ll probably be too late to recover the playerbase they need. I do hope that Bugbear can prove me wrong. We’ll just have to wait and see. In the meantime, I hope to see you on the derby grounds. Don’t be a stranger, come say howdie!